The largest sunspot seen in 24 years is rotating back to face the Earth, and it looks to have grown even bigger. Last month, the solar active region known as AR2192 (also known as AR12192) entertained the world with the sunspot clearly visible with the naked eye (with some appropriate and approved solar-watch or eclipse dark glasses, of course), and produced a series of large flares. But after spending some time over on the far side of the sun, it hasn’t finished impressing us yet. AR12192 is due to rotate back onto our side of the sun today and and it has grown. Because of its size, the leading edge would actually have appeared about a day earlier. Charles Lindsey, of North West Research Associates (NWRA) in Boulder Colorado, has been following the progress of AR12192 since it disappeared around the west limb of the sun a couple of weeks ago, and found that it has grown significantly. The sun rotates about once every 27 days as viewed from the Earth, so we haven’t been able to see AR12192 directly since then. But using the helioseismology technique acoustic holography that Dr Lindsey and his colleague Doug Braun developed, they can “see” large active regions on the far side by computationally regressing oscillations (waves) observed on the nearside back to their sources. Drs Lindsey and Braun’s far side imaging technique is now routinely used to keep an eye on active regions popping up or developing on the other side of the sun. The image (above) shows a seismic reconstruction of the far side (in yellow) with a very clear and very large active region in the southern hemisphere. This is AR12192. So, what is an active region, and how does it relate to sunspots? Active regions are huge agglomerations of magnetic field that bubble up to the surface from deep in the sun’s interior. Sunspots are the areas of strongest field, up to about 3,000 Gauss. To put that in context, the Earth’s magnetic field is around half a Gauss. The magnetic field largely inhibits the boiling convection normally seen across the solar surface. Convection is the mechanism that carries most of the energy from the nuclear furnace in the core through the outer 29% of the sun. That is why sunspots appear dark; magnetism halts the conveyor belt. The sun is currently near the maximum of Solar Cycle 24 – the 24th cycle of solar activity since detailed recording began in 1755. Sunspot number rises and falls on a roughly 11-year cycle, and although Cycle 24 is very weak compared to others in the last century, it can still produce a doozy of a spot. But active regions don’t just give us sunspots. They also produce flares, the most energetic events in the solar system. Flares occur when the complex magnetic field twists and stretches to such an extent that it snaps, like a rubber band breaking, and then reconnects to other field lines. This releases huge bursts of energy over several minutes, up to 6×1025 Joules for the largest X-class flares. This is about 100,000 times the total energy usage of humans in a full year. 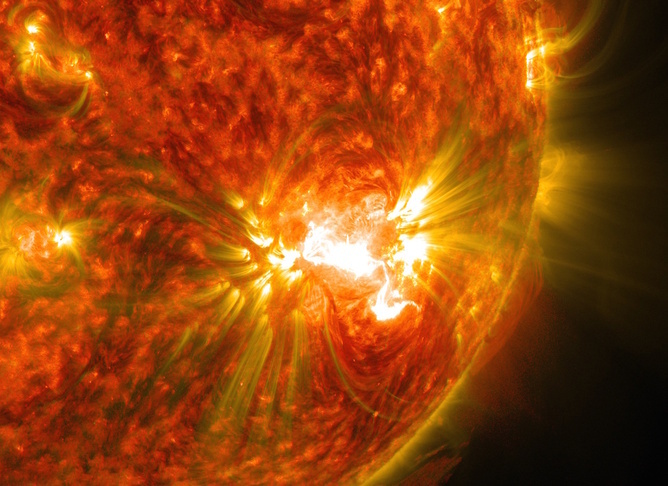 Coronal mass ejections (CMEs) also commonly emerge from active regions. These are massive bubbles of gas, weighing as much as 100 billion kg, that burst into space at up to 1,000 km per second, carrying huge loads of charged particles and magnetic flux. CMEs are often – though not always – associated with flares, and flares may or may not have accompanying CMEs. A flare that doesn’t is termed “ordinary”. On its first pass, the huge AR12192 was comparable in size to Jupiter and produced several (ordinary) X-class flares and many smaller ones, but no large CMEs. But Hugh Hudson of Space Sciences Laboratory at Berkeley, California, notes that older active regions tend to produce more CMEs, so he is expecting a big CME show this time around. But what does this mean for us on Earth? CMEs in particular can have a massive impact on the Earth’s magnetosphere, causing stunning aurorae, power blackouts, interruptions to telecommunications and damage to satellites in orbit. The so-called Carrington flare of 1859 produced aurorae visible in Queensland, and damaged telegraph stations around the world. Our modern technological world is far more vulnerable. So, if AR12192 launches any large CMEs in our direction when it comes around to our side, we’d better batten down the hatches. That can mean disconnecting long-distance power grids, placing satellites in safe mode and rerouting aircraft on polar routes. Paul Cally, Professor of Solar Physics at Monash University, has previously received funding from the Australian Research Council.